Rule 5 enforcement has been going on in Indiana for more than 10 years, but municipal inspectors still report seeing many of the most basic Rule 5 violations on sites during the construction season. Construction site runoff is one of the leading pollution sources to local streams, and is, therefore a regulatory and quality-of-life priority for all local municipalities. With all of these violations and the amount of runoff entering our streams, several MS4 coordinators agree that far too many local contractors really do not understand or prioritize the practices that they have the task and responsibility of installing, maintaining and eventually removing. Contractors need to be knowledgeable enough to know when a practice is failing or is even ill-prescribed for given site conditions. The Trained Individual Contractor Certification Program provides training and testing for those responsible for the management of Rule 5-permitted construction projects in Indiana, also known as a “Trained Individual”. The focus is on the implementation of construction Stormwater Pollution Prevention Plans (SWPPPs) through the proper installation, maintenance and inspection of erosion, sediment, and other pollution controls, also known as construction-phase best management practices (BMPs). 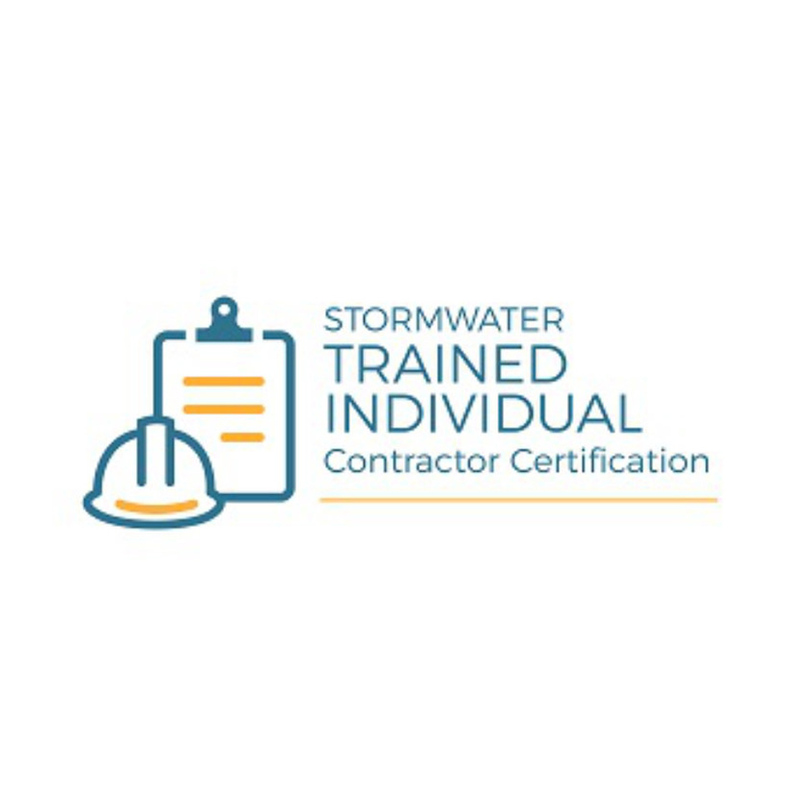 The program is designed to provide contractors with the knowledge to better manage their Rule 5 construction sites and stay in compliance with local stormwater ordinances. This training provides them with the information to fix common failures effectively and/or work with the project engineer to make necessary changes therefore avoiding fines and stop-work orders. Enforcement is on the rise; therefore, being trained and certified is a great way to stay in compliance, and even secure future business as a responsible contractor. The program offers two tracks, the first of which is a Basic Training & Certification focused on the installation, maintenance and inspection of the most common construction BMPs, in addition to regulatory and other relevant information. Those who complete the Basic Training and pass the optional test receive a Trained Individual Certification and are added to a database of Trained Individuals. The database allows participating municipalities to verify contractor qualifications. Anyone participating in the program and seeking certification must start with this track in order to ensure a good understanding of the fundamentals and sit for the certification test. The second track is designed as a continuing education (Advanced Training) opportunity that covers a variety of current topics developed each year, such as on-going SWPPP development and implementation challenges, stormwater industry trends, emerging technologies, green infrastructure, regulatory changes, case studies and other development and stormwater-related components. The Advanced Training is designed to provide continuing education and a recertification opportunity for certified Trained Individuals, but is open to anyone. Only those who complete the Basic Training and pass the test obtain a Trained Individual Certification, which is valid for two years. Once certified, the Trained Individual must attend either a Basic Training or Advanced Training at least once every two years to maintain the certification. No re-testing is required to maintain the certification unless it is allowed to expire, in which case re-testing is required to renew the certification. If your certification has expired, you can attend either Basic or Advanced Training; however, you must sit for the Basic Training test if you want to renew your certification. If you have more questions about which class you need to attend? Visit the FAQs below for more detailed questions and answers about the tracks and testing. Both Trained Individual Certification Trainings are offered on the same day typically in late February or early March at the Hamilton County Fairgrounds in Noblesville. The workshop runs from 8:30 am-4:00 pm. Lunch, snacks, and workshop materials including a manual are provided. The 2019 training will be held on Thursday, February 28, 2019. Additional Basic Training and recertification opportunities may be offered at another time of the year pending available staffing resources. Registration for the 2019 Trained Individual Contractor Certification is CLOSED. Cost of the training is $100. Simply put: it’s required. Cities and towns and other MS4 entities are required under Rule 13 to address construction site run-off and reduce stormwater pollution. Rule 5 sets up several requirements related to reducing construction site run-off, including the having a ‘Trained Individual’ on active construction sites to insure SWPPP compliance. While Rule 5 enforcement has been going on in Indiana for more than 10 years, municipal inspectors still report seeing many of the most basic Rule 5 violations on sites during the construction season. Contractors need to be knowledgeable enough to know when a practice is failing or is even ill-prescribed for given site conditions. This training will provide them the knowledge to fix the failure effectively and/or work with the project engineer to ensure that the construction site stays in compliance (therefore avoiding fines and stop-work orders). Construction site run-off is one of the leading pollution sources to local streams and is therefore a regulatory and quality-of-life priority for all local municipalities. Enforcement is on the rise; therefore, being trained and certified is a great way to stay in compliance, and even secure future business as a responsible contractor. Why take the White River Alliance course? Many other training programs exist that focus on becoming a “Certified Inspector” for Rule 5 sites. However, this program is designed from the perspective of the contractor, rather than that of an outside inspector. Program content targets specific best management practices, including the mechanics of how these practices are designed to work, as well as how to better install and maintain them from the contractor’s perspective. Who should attend and do I need recertification? Contractors, builders, developers and engineers will all benefit from attending; however, the training is specifically targeted to contractors and those physically developing the site. Certifications are valid for two years from the date the test was passed. If you attended and passed the test last year, you do not need to attend again this year; however, you will need to attend the following year in order to keep your certification valid. Gaps in certification will require retesting. If you attended last year, but did not take the test, you can attend the workshop again and sit for the test, or just register to sit for the test. Likewise, if you attended last year and passed the test and simply want to refresh your knowledge, you are welcomed and encouraged to attend again this year. If you are uncertain of your certification standing or have other program questions, please contact us at info@thewhiteriveralliance.org. Both the Basic Training and Advanced Training will be offered to participants every year. The Advanced Training is open to all. For those who have previously obtained the Basic Training Trained Individual certification, the Advanced Training counts towards the 2-year recertification requirement. How often is the training and testing available? The training is offered in late February/early March every year. Additional Basic Training and recertification opportunities may be offered at another time of the year pending resources. Please email us at info@thewhiteriveralliance.org to inquire about upcoming opportunities. Which communities recognize or require this particular certification? Does this count for INDOT or other communities’ requirements? No, each MS4 (including INDOT) is responsible for defining what it means to be a Trained Individual and establish their own training and enforcement programs for Rule 5. The several municipalities that have partnered together to create the Alliance’s Trained Individual Program have done so in order to leverage resources and unify messages and training materials within the region. Other MS4 jurisdictions may have their own requirements. Does this count for continuing education credits? Yes, this qualifies for continuing education credits for sediment and erosion control inspection certifications such as CISEC, CPESC, and CESSWI.